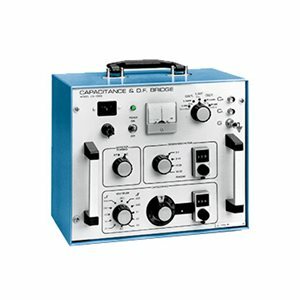 Designed for testing in the laboratory, shop or substation, Model CB-100 is a self-contained instrument that accurately measures insulation characteristics. Model CB-100 tests even in hostile environments where nearby excited devices may prevent meaningful measurements. Capacitance and dissipation factor read out directly from the instrument - no calculation is required. Unit tests complex insulating systems without changing leads.